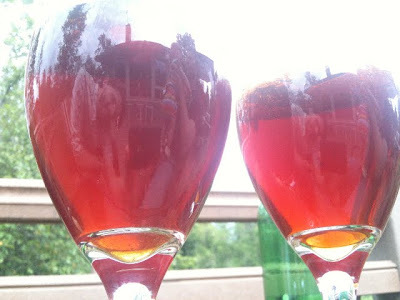 For our tasting on Sunday we did a side-by-side of our very own two Scotch ales. The first we brewed on February 28th using a basic Scotch style recipe but for the second we experimented a bit with the use of "Honey" malt and Carapils (dextrin) malt to give it a very slight honey taste and a more substantial mouth feel. The first (right) is about 4 months old and contains 20 lbs Pale, 4 lbs Vienna, 4 lbs Munich, and 1 lb Crystal 80. The second (left) is similar being only 1.5 months old and containing 20 lbs Pale, 4lbs Munich (Dark), 4 lbs "Honey" malt, 4 lbs Carapils, and 1 lb Crystal 80. While my older beer was much more mature in flavor and had clarified quite a bit more, I think I preferred my "direction" with the newer recipe. 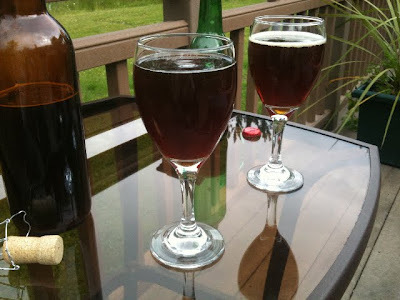 If I carbonate the newer one properly (this one is not quite where I would have it) and allowed it to age, I think it would really surpass the older recipe. I was interested how people reacted to trying both in light of my own assessment people seemed to uniformly prefer the beer that was older and slightly more carbonated. You can see above that the difference in carbonation is not extreme... perhaps people don't prefer that honeycomb reminiscent sweetness. The old beer is a bit drier starting at 1078 OG and finishing out at 1018 FG, while my newer batch began at 1074 OG and terminated at 1030 FG. Honey malt is able to contribute that sweet "honey-like" flavor because it produces large amounts of complex sugar strains that are more difficult for the yeast to consume. This leaves more sugar in the end product and accounts for my significantly higher final gravity. Dextrin malt also contributes a similar effect however I did increase the grain bill to compensate for the this addition. All in all, while the beer is sweeter, it is by no means sweet. The sweetness is hinted at and balanced by hops and once we tap our keg of it we will be able to see exactly how the carbonation level effects the experience. Cheers, and pour one for me.